Noise functions are a way to produce continuous pseudorandom values across one or more dimensions. The simplest example is a one-dimensional noise function that makes the y-value wobble up and down smoothly, but unpredictably, as you move along the x-axis. It's also possible to produce 2-dimensional noise, where the amplitude of the noise depends on the x,y coordinates you're sampling. This can be used to create hilly terrain in a video game, or more generally, it's used in computer graphics for procedurally generating textures or making bumpy surfaces. The original version of Minecraft used a 2D noise function to generate heights for terrain as a function of (x,y) coordinates, and later versions used a 3D noise function to generate terrain density as a function of (x,y,z) coordinates to produce overhangs and caves, as Notch describes here. More commonly, Perlin Noise and Simplex Noise are used. They are slightly more complicated algorithms that rely on similar principles: generate a large amount of random values, then look up and combine those values to get the value at a particular point. 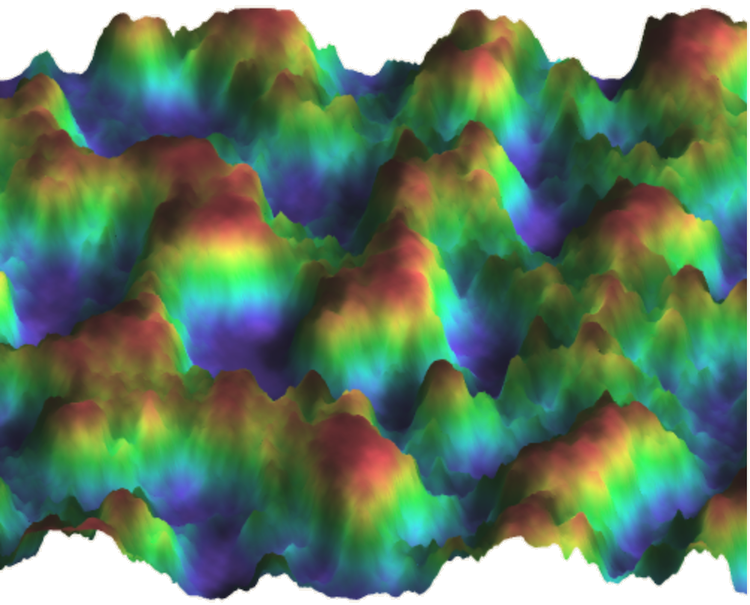 However, with Perlin and Simplex noise, the values are used as gradients (partial derivative vectors), rather than heights, which produces slightly better-looking noise. Notice that the values produced by the Simplex Noise tend to be very heavily biased towards 0.5, and it's very uncommon to see values close to 0 or 1. (The implementation here is based on the SimplexNoise1234 implementation used in the LÖVE game engine.) For many use cases, it might not matter that the distribution of values is not uniform. In my opinion though, it's better to have a predictable distribution of values, which can be easily modified to get whatever distribution is desired for your use case. As an alternative to address some of these issues, I present a new noise function, which I call "Hill Noise". It's inspired by Fourier Decomposition: any periodic function can be broken down into a sum of sine waves of different amplitudes, wavelengths, and offsets. If you generalize the idea, you can create an arbitrarily complex and wobbly function by summing together a bunch of sine waves of different amplitudes, offsets, and wavelengths. If you sum together a bunch of sine waves, then the pattern will only repeat itself after the least common multiple of the periods of the sine waves. For example, the function y = sin(x/2) + sin(x/3) has a period of 62π. But the function y = sin(x100/201) + sin(x100/301) has a period of 605.012π, which is much larger because the two sine waves are slightly misaligned and take a long time to resynchronize. For two sine waves with randomly chosen periods, the resulting function typically has an incredibly large period. Even if the periods aren't randomly chosen, functions with a very long period can be produced easily. For example: sin(x1) + sin(x.91) + sin(x*.91^2) has a period of 10,000 * 2π. The result of this is not terribly satisfying, because some of the sine waves are undesirably steep. If we're trying to mimic the bumpiness of real life things, you typically don't see bumps in the road that are as tall as a mountain, but as wide as a pebble. Generally, the shorter the length of a bump, the shorter the height of a bump. So, in order to emulate this, instead of sin(x/wavelength), let's use wavelength*sin(x/wavelength), which makes the amplitude directly proportional to the wavelength. This concept is similar to the Weierstrass Function, which has the sort of bumpiness we're looking for. Because we added the random offsets earlier, we can now create two different noise functions with the same wavelengths, but which produce totally different noise! Nice! So far, this is looking pretty good, but when we throw in a whole lot of sine waves of similar amplitude, they kind of tend to average out and we get a very bland noise function. According to the Central Limit Theorem, randomly sampling points on this noise function will have an approximately normal distribution, and the standard deviation will get smaller and smaller when more sine waves are added. In order to counteract this, we need to use the cumulative distribution function of the normal distribution. Unfortunately, it's rather tricky to compute the cumulative distribution function, but luckily we don't need to be very exact, and Wikipedia conveniently has an entire section on numerical approximations of the normal CDF. Using a little bit of math black magic, it's possible to calculate the standard deviation of the sum of the sine waves, and plug it into the CDF approximation. That's quite powerful! And it's not something that can be easily achieved with just any old noise function. Now, this is a lovely noise function, but it only works for 1 dimension of input. Let's expand it to work in 2 dimensions! Instead of summing up sin(x) values, let's sum up (sin(x)+sin(y))/2 values. These will be axis-aligned, which is problematic because it will make the noise function much less random-looking, so for each 2D sine wave, let's rotate its coordinates by a random angle. That looks pretty good, but sometimes the randomly generated rotations are nearly aligned for similar-sized sine waves, and it causes some unfortunate aliasing. Really, we don't need the rotations to be random, but we want them to be fairly evenly distributed, and similarly sized sine waves should have not-parallel, not-perpendicular rotations. There's a fairly clever trick for doing almost exactly this task using the Golden Ratio, that I learned about in this blog post about generating random colors programmatically. Let's use that technique instead of purely random rotations. Whew! That's a heck of a function! But look at the great results! Will (practically) never repeat itself. Has highly configurable characteristics that are easy to understand (sine wave counts and size distributions). Is memory efficient and easy to implement in a shader, even without access to a pseudorandom number generator. Produces noise that is (nearly) uniformly distributed across the [0,1] interval. Can be modified to calculate exact surface normals/gradients. This page has been viewed ~299 times.